Today was a big-twiching day. Recent postings on Birdbrains introduced several interesting birding opportunities. A female Common Goldeneye and several Buffleheads had returned to a pond on Fruitville Road in Sarasota. And an American Black Duck and an Eared Grebe are reported along Cockroach Bay Road near Ruskin. All are unusual this far south. Today is also my Dad's 77th birthday, which we celebrated on Sunday. While visiting with them we observed a gathering on the telephone wires outside his home, near lake Placid, of no less than 300 Brown-headed Cowbirds with a few Boat-tailed and Common Grackles mixed in. Tryed scanning for any bronzed or shiny cowbirds with no luck. But today, I started a big day by waiting for a trio of Red-Cockaded Woodpeckers to exit their nest holes at sun-up at Babcock-Webb Wildlife Management Area in Charlotte County. As I arrived, meet Rick Greenspun and Bob Jones, who were from the Tampa area looking for lifers for Bob. It was interesting that John was involved with the locating and documenting the black duck and eared grebe. So he gave me assistance on how best to find these birds and I gave them an up date on activities at Harn's Marsh, which was their next stop. So from here I was heading into their territory as they were heading into mine. By 7:10 the woodpeckers had exited their nest holes and had taken off. Here we split up to explore for brown-headed nuthatches. Did locate several House Wrens, Pine Warblers, Palm Warblers, Eastern Towhees, Eastern Meadowlarks and a Northern Harrier, plus many of the expected birds and a Black Racer, but no nuthatches. My stay here was shortened, due to my extra scheduled stops and by 9:00 am I was heading north of I-75 to Sarasota. By 9:45 I had arrived at the Fruitville Road exit, were my first stop was the Fruitville Library. I found the Monk Parakeets that live here plus a Belted Kingfisher, Eurasian Collared Doves and a Loggerhead Shrike in the parking lot. Next checked the nearby Ackerman Park and the Celery Fields. The lake at Ackerman Park held a lot of birds including American Coots, Double Crested Cormorants, Pie-billed Grebes, Lesser Scaups, Blue-winged Teal, Ring-necked Ducks, Mottled Ducks, Anhingas, a Lesser Yellowlegs and three Ruddy Ducks. Only stopped at the Celery Fields briefly were at least ten Sandhill Cranes passed over and several Sanderlings, Lesser Yellowlegs and Greater Yellowlegs were present in the drying pond near the gazebo. The only ducks observed at the time were a dozen Mottled Ducks. Could add a Roseate Spoonbill several White Ibis and Glossy Ibis and had a Northern Harrier hunting over the wetlands. Palm Warblers and Savannah Sparrows were present at the gazebo area. My list was short of here as I did not stay long. Because next it was time to look for the Common Goldeneye. A few miles east on Fruitville Road is the Founder's Club pond. Parking is at the church across the street were I met a fellow named John who was leaving after spending a couple of hours scanning for the goldeneye without any luck. 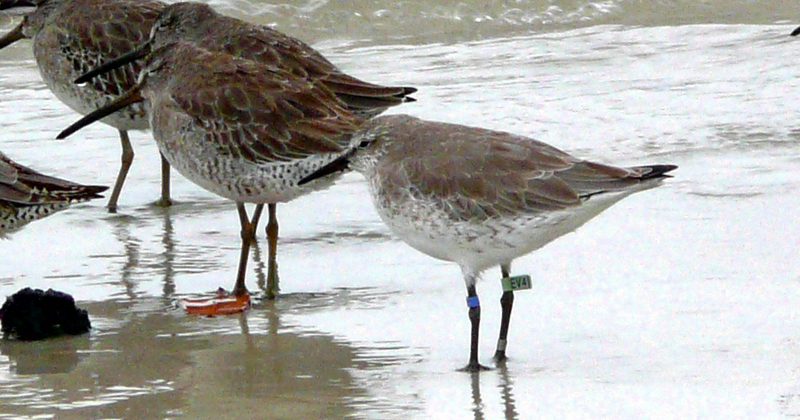 So I hoped for the best, but when you travel a long ways to locate a single bird there is the reality of failure. Have experienced this before. Met a couple of ladies scoping the pond from the sidewalk. They had a Redhead in the scope and were still hoping to sight the goldeneye. Well when I moved down the sidewalk for a new vantage point, almost immediately spotted the bird. The female Common Goldeneye would only briefly remain visible before diving for a meal. She remained difficult to relocate and I could not get a photograph. The pond was loaded with birds included FOS Buffleheads, many Hooded Mergansers, Blue-winged Teal, Lesser Scaups, Ring-necked Ducks, Mottled Ducks, Pied-billed Grebes, Anhinga, a couple of Redheads and several waders. Next stop was at Cockroach Bay Road, off US 41, near Ruskin, in Hillsborough County. Reports stated that an American Black Duck was present in the second mitigation pond. I stopped at the first mitigation pond were American White Pelicans. 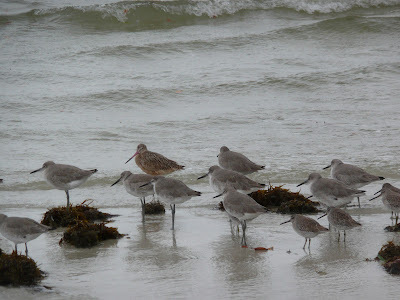 Caspian Terns and American Avocets were present. These ponds were loaded with birds including all the waders, Belted Kingfishers, Roseate Spoonbills, Wood Storks, Greater and Lesser Yellowlegs, Long-billed Dowitchers, Sanderlings, Black-bellied Whistling Ducks, Blue-winged Teal, Northern Shovelers, Mallards, Lesser Scaups, Ring-necked Ducks, American Coots, Anhingas, Double-crested Cormorants and more. At the second pond I met an avid birder named Steve who was looking for the American Black Duck. He, sporting a shirt labeled Bird Nerd, and had already located the Eared Grebe at the nearby Cockroach Bay Preserve and now had a the suspect duck in his scope. The bad part here was that the lighting was so poor. We both agreed though that we had located the American Black Duck right where reports said to look. Steve reported that he had already found a gadwell, which I failed to relocate. Would have been nice, but the black duck was the reward. Hadn't seen one in over thirty years, back when I lived in Illinois. Next stop were the ponds at Cockroach Bay Preserve on Gulf City Road. After checking in at the rangers office, headed out back to the ponds. Quickly found a Spotted Sandpiper, a flock of Western Sandpipers and a Lesser Yellowlegs. The ponds had several Anhingas and Double-crested Cormorants. Had to have held sixty plus Hooded Mergansers. A few Lesser Scaups and Ring-necked Ducks were present. Found the Eared Grebe, a LIFER, in the company of three Pied-billed Grebes. Also had a juvenile hawk land in some brush close by. I originally believed it was a juvenile red-shouldered hawk, but after looking at enlargements of photos I had second thoughts. I now think that it is probably a juvenile coopers hawk. The eared grebe was a nice hit. Had hoped to add it when I went to Idaho last month, but getting today was satisfying. I was able to recheck on the American Black Duck as I was heading for home. The lighting had improved and was able to relocate the bird. Then it is time to head home. It was a good day. Headed back to Bunche Beach early Saturday morning with the idea of finding any American White Pelicans an a very foggy morning. The tide was low and falling. Very birdy as well. Walked both endsof the beach, finding the usual hundreds of resting Black Skimmers and all the usual shore birds and waders. Did find a FOS first winter Herring Gull among the many Laughing Gulls. No ring-billed gulls this morning. Only saw a lone Royal Tern a few Sandwich Terns and Forster's Terns. The fog reduced visibility but an occasional pelican could be seen flying by, but only Brown Pelicans today. Found several Ruddy Turnstones some of which were well camouflaged in the leaf litter they were probing for breakfast. Other sightings over the Thanksgiving weekend included the Monk Parakeets and a Burrowing Owl in Cape Coral at the Pelican Boulevard ballfields. Sighted a Whip-poor-will on a fence post as I was heading into work on Thursday night. Its eye-shine gave it away as my car's head lights caught sight of it. On the way home Friday morning sighted a Great Horned Hawk being harassed by a Red-Shouldered Hawk as it was perched atop a pile of dead timber, awaiting kindling, at the recently cleared construction sight along Airport-Haul Road. I don't have a consistent place in Lee County to find these owls, so they are always welcomed when ever I can come across them. I have also been consistently locating a trio of Redhead duck, over the weekend, hanging with a flock of American Coots at the ponds on Domestic Street. These are my first sighting of Redheads in Lee County. Lesser Scaups, Ring-necked Ducks, Mottled Ducks and a Pied-billed Grebe are seen here too. Following work this morning I was interested in seeing if any American white pelicans could be found at Bunche Beach. My last sighting of the white pelican at Bunche Beach was a lone bird back in July. It was a summer holdover that had not followed the flocks north. But now the white pelicans are back. First stopped at Domestic Street to see what ducks are on the ponds and and if anything was new with the arriving sparrows. I had stopped here yesterday morning and did find American Coots and Ring-necked Ducks, but was interrupted by a cop curious as to what I was up too. Every once in a while the Law is suspect as to what's up. So far I haven't been harassed after explaining about bird watching. The same on this stop. But you never know when when you'll meet up with someone who not too bright. The hundred plus flock of American Coots were still here today and a few female Lesser Scaups were present. The best part was the flock of seven FOS Red-breasted Mergansers that flew in as I was checking out the ponds. Had never seen these mergansers here before, usually find them at the beast or at Ding-Darling NWR on Sanibel. The landowners usually keep the berms along the street moved, but currently they are very bushy and good habituate for Sparrows and several Savannah Sparrows are now present and finally I spotted a couple of FOS Grasshopper Sparrows. I had not seen any here last year, but a couple were usually seen the season before. The number of Mourning Doves have thinned out but today I counted five American Kestrels. The burrowing owls as still missing as is the northern bobwhites. Eastern Meadowlarks were singing. Mondays are usually my only full-day off of work and I often will schedule some kind of birding trip for the day. Currently there are a lot of opportunities for travel to locate the hard to find birds in my neighborhood. There is a reported lark sparrow up in St Petersburg, a potential lifer, and the says phoebe is reported to have returned to the fence were it had wintered the past two years up in Lake County on Ranch Road in Astatula. There was also a Great Cormorant at Viera Wetlands near Melbourne and Swainson's Hawks at Lucky Hammock. There was also the Green-tailed Towhee at Ft Pickens, near Pensacola, but I just read a report that it may have fallen prey to a coopers hawk or some other predator. A shame. But I have elected to stay close to home today. To run a blitz on my Lee County hot spots - Bunche Beach, Six-Mile Cypress Slough and Harns Marsh. So between 8:30 am and 1:30 pm I was able track eighty species for the day. Headed to Domestic Street in south Lee County. This had been a dependable site for burrowing owls until the babies fledged. Since then, seems they have moved on. But I was able to to locate a Red-tailed Hawk, several American Kestrals and about a hundred American Coots and one Pied-billed Grebe. Hoped to relocate lesser scaups and ring-necked ducks on the ponds, but none found here today.. But several Savannah Sparrows have shown up and hopefully grasshopper sparrows we be along soon. Lots of Palm Warblers and a Yellow-bellied Sapsucker too. Next was Six-Mile Cypress Slough. Got my FOS Ruby-Crowned Kinglet in the parking lot and added Gray Catbird, Yellow-rumped Wabler, Double-crested Cormorant, Anhinga, Eastern Phoebe and Green Heron. Did not spend much time on the boardwalk, as the blitz was on. On to Harn's Marsh. A walker I met here commented on a pair of river otters, but I missed them. Was rewarded with a calling FOS Sora though. Did not see the sora, but you can not mistake its call. Found more savannah sparrows and all the usual waders - Glossy and White Ibis, Great Egret, Little Blue Herons, Great Blue Heron, a Wood Stork etc. Several Tree Swallows were active as well as a lone Northern Rough-winged Swallow. Several Limpkins and Snail Kites were easily found. A couple of Northern Harriers were working the marsh too. There are always a lot of Black and Turkey Vultures here and hundreds of American Coots. The Lesser Scaups and Ring-necked Ducks missed on the ponds at Domestic Street were located here, plus several Mottled Ducks and pied-billed grebes. Other interesting birds seen here a Pileated Woodpecker, Palm Warblers and a noisy House Wren. Could not find any blue-winged teal though. So I drove over to the other entrance located next to Harn's marsh Elementry School. 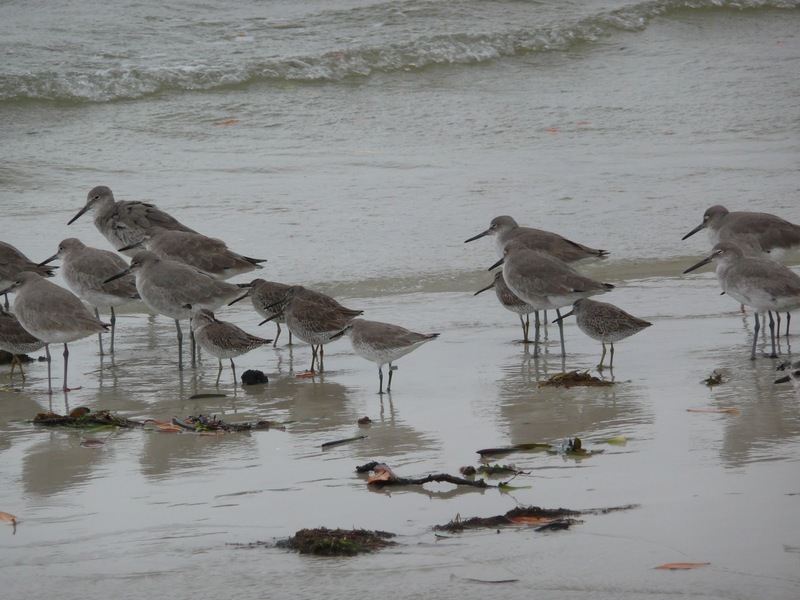 Here I was able to add the Blue-winged Teals and a Greater Yellowlegs. Missed on the sandhill cranes usually found here. After leaving, spotted a Bald Eagle flying overhead. Arrived at Bunche Beach at about noon. Lots of people on the beach. Season has started. But found a lot of birds here too. Including my FOS Ring-billed Gulls. 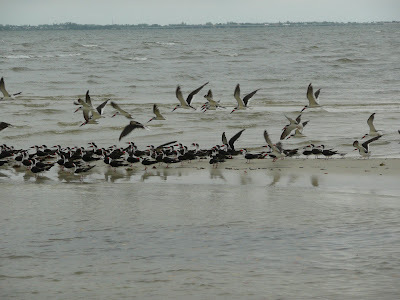 Had hope for white pelicans, but only saw Brown Pelicans way out, diving for there lunch. Hundreds of Black Skimmers resting on the beach with Royal, Sandwich and Forster's Terns mixed in. There were no waders present, but had all the expected shore birds - Willets, Short-billed Dowitchers, Marbled Godwits, Red Knots, Dunlins, Sanderlings, a lone Piping Plover, Black-bellied Plovers, a couple of Wilson's Plover and only saw one Semipalmated Plover. Saw a couple of Ruddy Turnstones and several Western and Least Sandpipers. Finished up after the visit to the beach. I was ready to wrap it up and head home. Lots of projects waiting for me there as well. 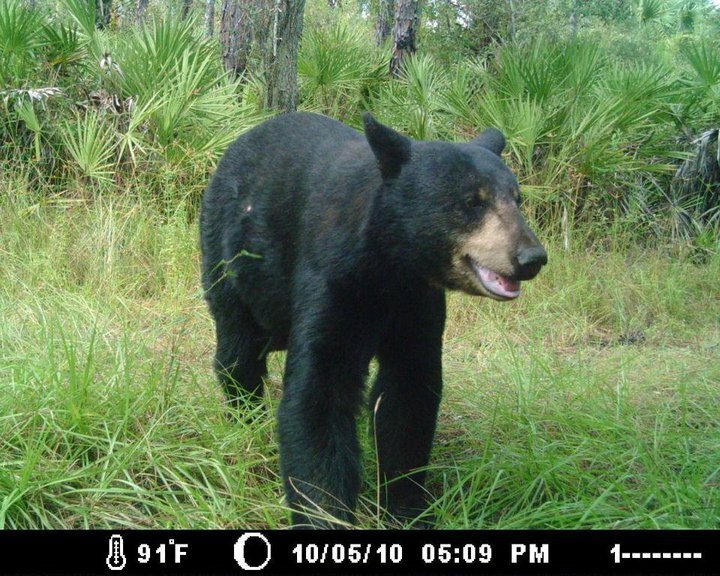 Corkscrew Swamp Sanctuary is a jewel, owned and operated by the Audubon Society in eastern Collier County. The lands were acquired at the time to save the last stand of ancient bald cypress as well as preserve an important nesting rookery for the endangered wood stork. Currently the storks are away, but nesting should began, as long as conditions are favorable, around January. But another treasure is to be found here in one of the rarest orchids to be found in Florida. The Ghost Orchid. On my visit the orchid was in bloom. A single blossom. When the plant was first discovered, here at Corkscrew a few years ago, people were coming here from all over the US and abroad to see this rare plant. This rare species was also the subject of a non-fiction book called 'The Orchid Thief' by Susan Orlean. The book was later is adopted in Meryl Streep's film Adaptation (2002). My visit was not to see the orchid but to see what birds could be found. Warblers, vireos and buntings were my targets on the day. Also Yellow-billed Cuckoos were being reported. The water level was to high for there to be a lot of wading birds. But I was more interesed in the little birds. Started out about 8:30 in the morning and spent some time waiting on any hummingbirds at the gardens at the front of Blair House. But none appeared as I watched. So onto the boardwalk. First checked the feeders at the back porch for painted buntings. No buntings at this time. Then checking for brown-headed nuthatches in the pines at the start of the boardwalk. But not on this day. Did find several Blue-Gray Gnatcatchers though. The days most common bird. Several Gray Catbirds were also heard. The first of several Red-Shouldered Hawks was seen. The beginning of the walk was frustrating as so many birds could be heard, but not seen. Especially Common Yellowthroats. But at about half way things improved when Yellow-billed Cuckoo flew into a small tree within a few feet of the boardwalk. Following this, were a couple of mixed feeding flocks featuring more gnatcatchers and Tufted Titmice. A pair of Great Crested Flycatchers were active and was able to add five more warblers imcluding Palm, Prairie, Black-and-White, Northern Parula and Pine Warblers. Also found White-Eyed and Blue-Headed Vireos. At the Lettuce Lakes was found a pair of Anhingas resting in the trees, plus a sleeping Black-Crowned Nightheron. Also here was a huge alligator basking in the sun on a island on the lake. It was disappointing to miss the buntings and hummingbirds, but the cuckoo made up for it. A family of three Sandhill Cranes was also seen along Immokolee Road just prior to the turn onto to Sanctuary Road on the way into Corkscrew Swamp. Early at sunrise on Saturday morning I headed to the CREW Marsh trailhead, which is located near to where Corkscrew Road intersects with rt-82 in Collier County. I was interested in locating any white-winged doves that might be found wire-sitting along Corkscrew Road or any eastern towhees that I have usually found near the trailhead at CREW Marsh. I spent about and hour and a half on several trails and was able to locate four warblers - Pine, Yellow-rumped, Common Yellowthroat and Palm Warblers. Woodpeckers were varied today including a pair of Hairy Woodpeckers, two pair of Downy Woodpeckers, several Red-bellied Woodpeckers, a lone Pileated Woodpecker and a FOS Yellow-bellied Sapsucker. Did miss on the towhees and doves, but did see a Crested Caracara on my way home. As I approached the trailhead parking area I was met by Brenda Brooks, Executive Director from the Crew Marsh. She was on-site to lead a scheduled visit from students from Florida Gulf Coast University. Brenda was interested in what I had encountered on my walk, because they had several sightings of black bears and a Florida Panther recently. Would have loved to have spotted a bear or panther, but not to close. Below is a photo of a black bear taken by a trail camera. Great Blue Heron, White Ibis, Wood Stork, Red-shouldered Hawk, American Kestrel, Mourning Dove, Red-bellied Woodpecker, Yellow-bellied Sapsucker, Downy Woodpecker, Hairy Woodpecker, Pileated Woodpecker, Eastern Phoebe, Blue Jay, House Wren, Blue-gray Gnatcatcher, Gray Catbird, Northern Mockingbird, Yellow-rumped Warbler, Pine Warbler, Palm Warbler, Common Yellowthroat, Boat-tailed Grackle A Crested Caracara was seen roadside on Corkscrew Road near the Corkscrew Water Plant. Tropical Storm Tomas was churning out in the Gulf of Mexico and we had been experiencing feeder bands with rain and winds. 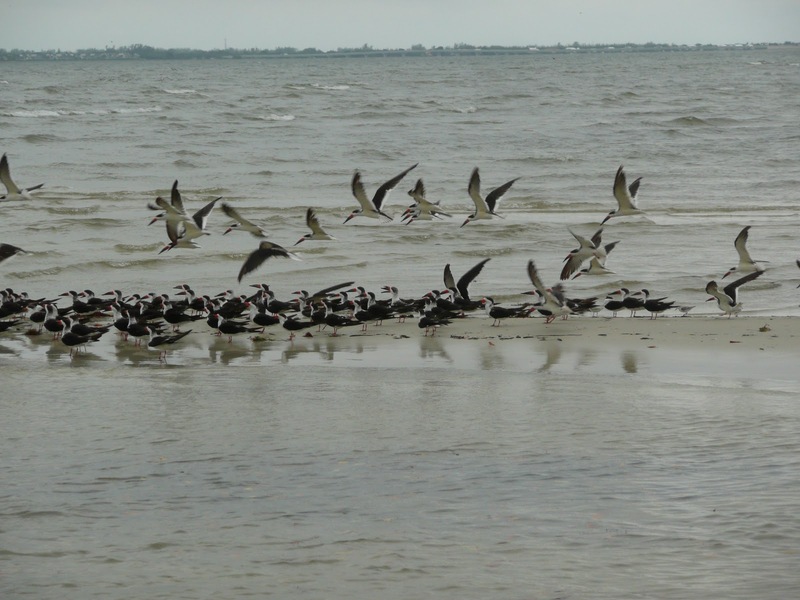 There was no danger for Southwest Florida from this storm, but the winds did offer a chance of pelagic birds to be pushed toward our shore. So, following work on Wednesday morning I headed over to Bunche Beach were I expected low tides. However the winds were piling waster into Estero Bay and the shore birds were gathered up on the little bit of the sand flats left exposed. Arrived about 8:15am and found a lot of birds huddled near the north inlet. 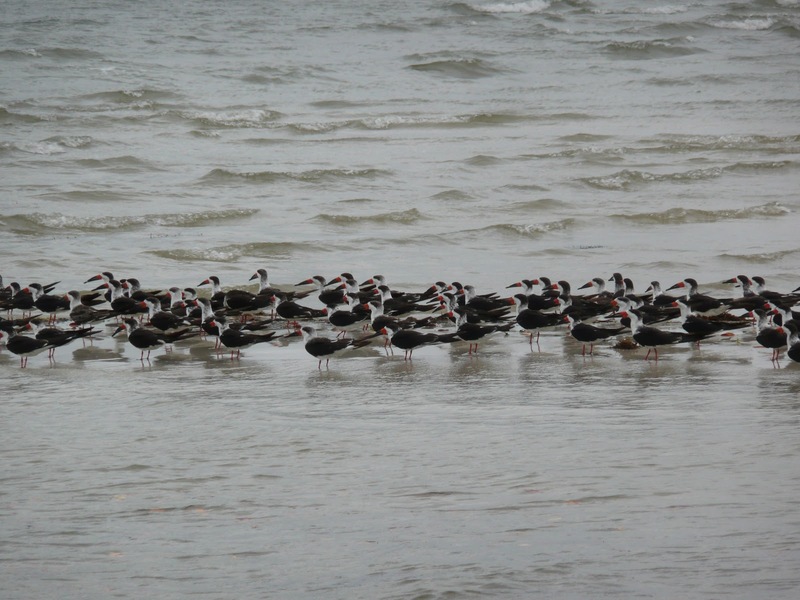 Hundreds of Black Skimmers were found resting on the remaining sand spit and would frequently take flight and quickly return. Often a single bird would call an alarm all would take off. No idea what danger they perceived as no falcons or eagles seemed to be at hand. There was a female Blue-winged Teal that kept flighting through the skimmers, trying to find a spot to join the gang. Some of her swoops would cause the cloud of birds to climb. No idea what a teal was doing here, but it was interesting. Other birds resting with the skimmers included a couple of Royal Terns, a few Forster's Terns a couple of Common Terns and a few Sandwich Terns. Some Laughing Gulls were present. Concentrations of Willets, Short-billed Dowitchers and Dunlins were here plus some Red Knots, Lots of Sanderlings, a couple of Piping Plovers, Black-belled Plovers a about three Wilson's Plovers. Always have several Semipalmated Plovers present too. A couple of Ruddy Turnstones, a lone Western Sandpiper and about six Marbled Godwits. Did try to pay attention to the sky with the idea of catching sight of pelagic birds. I don't own a scope, so I'm limited to what my bins can do for me. The usual Brown Pelicans, Gulls and Terns, plus a couple of Roseate Spoonbills and a Magnificent Frigetbid were seen over head. A couple of years ago I had the fortune to find a few Bridled Terns flying low at this spot on a day with similar weather conditions. But today the peligaics I could spot were overhead. Way overhead. About a dozen dark birds were soaring above, much too high for a good observation. They were were seen basically in silhouette, with square tails and crooked wings and were dark. No other color noted. My first though were jaegers. Later I considered brown noddy's. But I don't know what I had found. There is definitely a large learning curve in this area. The hundreds of Black Skimmers would take flight, circle and return. As the tide would rise, the Black Skimmers would finally move on.